Help! i have executed an infinite loop... How to stop the image. The image is your working environment. All your modifications are stored with its state. This video shows how you open your image how you can go back to the state before opening. In this video we take a tour around the basic UI elements and menus of the image. Help! My Image crashed! I lost all my changes! What should I do? .. Don't panic. There's a solution: Recover your changes. Halos provide an instant access to graphical elements of the image. This video shows functions they provide. The image has a menu for editing all your preferences. Additionally you can change your standard browser by using a browser menu. In "Demo Mode" all text is large enough to be legible while using a beamer, making a screencast or taking screenshots. You can access this preference by primary (left) click, then choose "appearance", then "system fonts", then "demo mode". Projects are a nice way to organise different workplaces in one image. They can also be useful for prototyping. Description This video shows how to get your code out of the image into the file system and back from the filesystem into the image. You can right click on each item in a browser – class category, class, method category or method. Then select file out (or Strg+o). The code is stored in a .st file in pathToImage/Contents/Resources/. To load a file's content into an image drag and drop the file into the image or open the "file list" browser from "Tools" and click "file in". 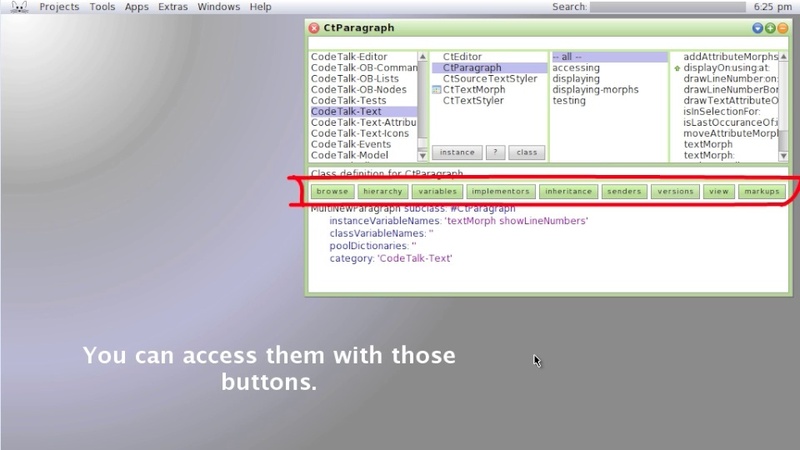 The class browser is the tool to access and edit source code in the image. It is your main working environment. 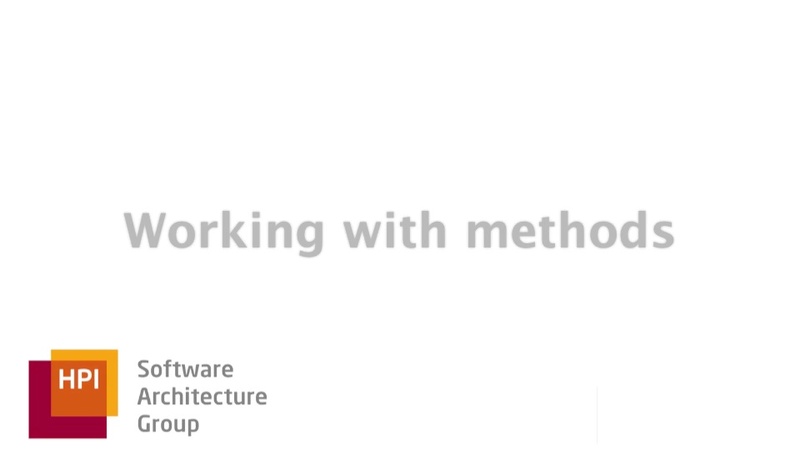 In this screencast we show how you can browse the hierachy, inheritance, senders and implementors of methods. You can also modify the class definitions. Furthermore the browser provides a nice function for generating accessor methods for all your instance variables. 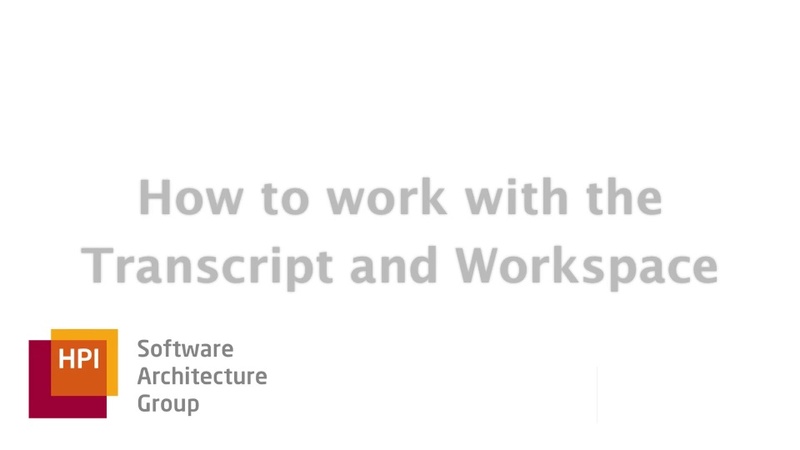 You will be guided through writing and executing code the Workspace and how to use the Transcript to inspect properties of objects. This video introduces the Object Explorer and Object Inspector, which are tools that you can use during debugging in order to comfortably inspect object properties. 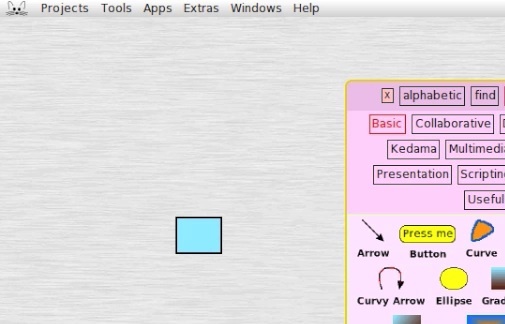 This video shows how to set breakpoints and demonstrates most of the debugger features. What to do if your image stopped responding because the UI process is hung up in something? The Monticello Browser will be introduced. It's the main versioning system for Squeak, a little like Git / SVN for other languages. You will see how to set up your own repository and a new package. As continuation of the first Monticello video, you will be shown to upload an initial version, view diffs between versions and commit changes. This video shows you how to resolve a conflict during a commit to a Monticello repo. This video shows you how to use the Gemtools to connect to a Gemstone/S VM and how to work with them. Continuing were the first "Filetree and Git" video left off, we show you how to fetch and merge changes made by other contributors and how to commit and push your own changes. 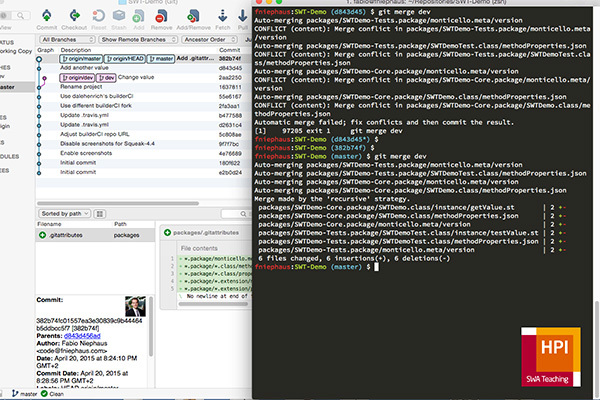 We'll also show you how to resolve merge conflicts inside the Squeak Image. Use git fetch && git merge --ff-only origin/master instead of git pull, so you can perform the actual Merge or Load operation using the Monticello tools in Squeak. If new commits are created concurrently in git, you will have to do an actual merge before you can push. You will not be able to merge using the fast-forward strategy and there would be conflicts in the filetree metadata if git tries to figure out the merge by itself. In order to remedy the situation, do the git merge preferring changes from the remote repository: git merge -s recursive -X theirs origin/master (since you still have your changes in the image, nothing is lost). Perform the actual merge in the Squeak image using Monticello. Save your merge to the filetree using Monticello Save. Commit and push your changed filetree with git. You may want to amend the merge commit. 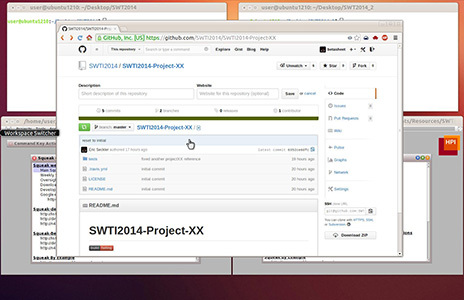 Description This video shows test driven development with SUnit. It shows how to use the test runner and covers the basic assertions and how to raise a custom error. The code used in this example can be found here: HowTo-SUnit.st​ (click icon for download, link text for viewing). 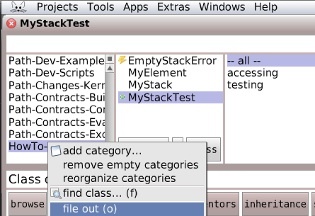 A test suite is created by subclassing TestCase (e.g. 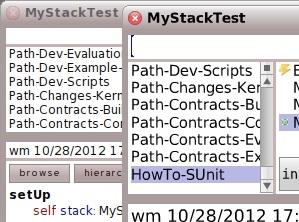 MyTestSuite). 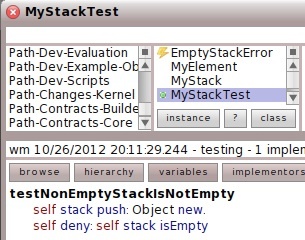 Any method named testXYZ in the test suite is considered a unit test. Fixtures are initialized in #setUp and cleared (if necessary) in #tearDown. For code that should be run once per test suite, use MyTestSuite>>initialize. 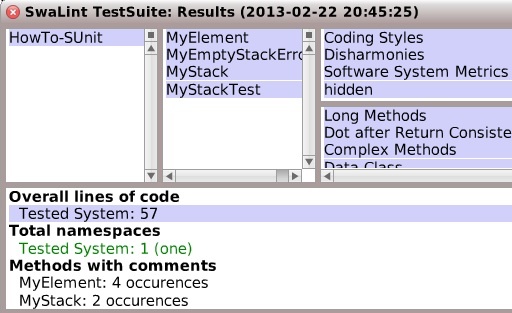 For code that should be run before and after every unit test, use MyTestSuite>>setUp and MyTestSuite>>tearDown. Custom errors (e.g. MyError) can be created by subclassing Error. To raise an error, use #signal:. Description This video shows how to analyse the test coverage of a package. The test coverage measures how many percent of a package's methods are called in its tests. Make sure a package exists which is named like the class category before a dash. For example the class category is called "HowTo-SUnit" the package has to be named "HowTo". You can add a package in the "Monticello Browser" which can be found in "Tools". 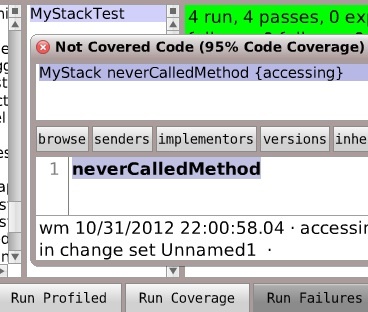 To run a test coverage analysis open the test runner, click "Run Coverage" and select the package. After all tests are run you see a list of methods which aren't covered and the ratio of covered methods and all package's methods. This video shows how to find unidiomatic code and how to collect statistics about a given class or package. 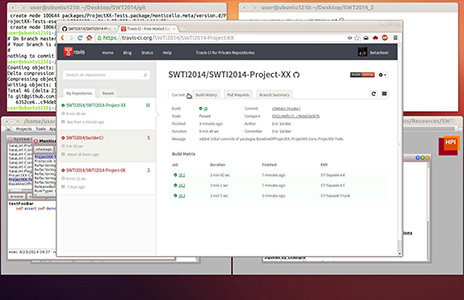 Open SwaLint from the Apps menu to perform static code analysis, which check for idiomatic code and gather code metrics. Then select the packages and classes you want to analyze. A reporter presents the results and offers to browse the occurrences of mismatches. Monticello-Introduction-3.png​ (314.8 KB) - added by patrick.rein 7 years ago. Image-Projects-1.png​ (35.7 KB) - added by patrick.rein 7 years ago. Image-Projects-2.png​ (88.3 KB) - added by patrick.rein 7 years ago. Image-Updating-1.png​ (43.0 KB) - added by patrick.rein 7 years ago. Monticello-DiffingAndChanges-1.png​ (66.8 KB) - added by patrick.rein 7 years ago. Monticello-DiffingAndChanges-2.png​ (206.6 KB) - added by patrick.rein 7 years ago. Monticello-Introduction-1.png​ (63.3 KB) - added by patrick.rein 7 years ago. Monticello-Introduction-2.png​ (296.6 KB) - added by patrick.rein 7 years ago. Monticello-ResolvingConflicts-1.png​ (46.6 KB) - added by patrick.rein 7 years ago. Monticello-ResolvingConflicts-2.png​ (170.5 KB) - added by patrick.rein 7 years ago. Browser-AdvancedBrowsing.m4v​ (15.5 MB) - added by patrick.rein 7 years ago. Browser-ClassBrowser.m4v​ (5.0 MB) - added by patrick.rein 7 years ago. Browser-MethodsInBrowser.m4v​ (7.3 MB) - added by patrick.rein 7 years ago. Browser-ClassStateSetterGetters.m4v​ (2.5 MB) - added by patrick.rein 7 years ago. Browser-AdvancedBrowsing-1.png​ (43.4 KB) - added by patrick.rein 7 years ago. Browser-AdvancedBrowsing-2.png​ (220.5 KB) - added by patrick.rein 7 years ago. Exploring-ObjectExplorerInspector-1.png​ (51.4 KB) - added by patrick.rein 7 years ago. Debug-Debugger.m4v​ (7.2 MB) - added by patrick.rein 7 years ago. Debug-StopProcessing.m4v​ (2.0 MB) - added by patrick.rein 7 years ago. Exploring-ObjectExplorerInspector.m4v​ (26.7 MB) - added by patrick.rein 7 years ago. Exploring-TranscriptWorkspace.m4v​ (5.5 MB) - added by patrick.rein 7 years ago. Image-BrowserAndSetting.m4v​ (2.7 MB) - added by patrick.rein 7 years ago. Image-Halos.m4v​ (5.4 MB) - added by patrick.rein 7 years ago. Image-Introduction.m4v​ (2.3 MB) - added by patrick.rein 7 years ago. Image-Navigating.m4v​ (6.1 MB) - added by patrick.rein 7 years ago. Image-Projects.m4v​ (3.8 MB) - added by patrick.rein 7 years ago. Image-Updating.m4v​ (565.1 KB) - added by patrick.rein 7 years ago. Monticello-DiffingAndChanges.m4v​ (7.2 MB) - added by patrick.rein 7 years ago. Monticello-Introduction.m4v​ (4.1 MB) - added by patrick.rein 7 years ago. Monticello-ResolvingConflicts.m4v​ (10.6 MB) - added by patrick.rein 7 years ago. Browser-ClassBrowser-1.png​ (39.3 KB) - added by patrick.rein 7 years ago. Browser-ClassBrowser-2.png​ (159.0 KB) - added by patrick.rein 7 years ago. Browser-ClassStateSetterGetters-1.png​ (58.6 KB) - added by patrick.rein 7 years ago. Browser-ClassStateSetterGetters-2.png​ (323.7 KB) - added by patrick.rein 7 years ago. Browser-MethodsInBrowser-1.png​ (44.6 KB) - added by patrick.rein 7 years ago. Browser-MethodsInBrowser-2.png​ (207.8 KB) - added by patrick.rein 7 years ago. Debug-Debugger-1.png​ (38.9 KB) - added by patrick.rein 7 years ago. Debug-Debugger-2.png​ (253.5 KB) - added by patrick.rein 7 years ago. Debug-StopProcessing-1.png​ (41.0 KB) - added by patrick.rein 7 years ago. Exploring-ObjectExplorerInspector-2.png​ (198.3 KB) - added by patrick.rein 7 years ago. Image-BrowserAndSetting-1.png​ (44.8 KB) - added by patrick.rein 7 years ago. Image-BrowserAndSetting-2.png​ (240.6 KB) - added by patrick.rein 7 years ago. Image-BrowserAndSetting-3.png​ (221.5 KB) - added by patrick.rein 7 years ago. Image-Halos-1.png​ (33.5 KB) - added by patrick.rein 7 years ago. Image-Halos-2.png​ (255.0 KB) - added by patrick.rein 7 years ago. Image-Introduction-1.png​ (41.7 KB) - added by patrick.rein 7 years ago. Image-Introduction-2.png​ (280.7 KB) - added by patrick.rein 7 years ago. Image-Introduction-3.png​ (51.9 KB) - added by patrick.rein 7 years ago. Image-Navigating-1.png​ (49.3 KB) - added by patrick.rein 7 years ago. Image-Navigating-2.png​ (348.8 KB) - added by patrick.rein 7 years ago. Browser-AdvancedBrowsing.webm​ (13.6 MB) - added by patrick.rein 7 years ago. Browser-ClassBrowser.webm​ (5.8 MB) - added by patrick.rein 7 years ago. Browser-ClassStateSetterGetters.webm​ (2.7 MB) - added by patrick.rein 7 years ago. Browser-MethodsInBrowser.webm​ (8.0 MB) - added by patrick.rein 7 years ago. Debug-Debugger.webm​ (7.8 MB) - added by patrick.rein 7 years ago. Debug-StopProcessing.webm​ (1.8 MB) - added by patrick.rein 7 years ago. Exploring-TranscriptWorkspace.webm​ (6.5 MB) - added by patrick.rein 7 years ago. Image-BrowserAndSetting.webm​ (2.7 MB) - added by patrick.rein 7 years ago. Image-Halos.webm​ (4.9 MB) - added by patrick.rein 7 years ago. Image-Introduction.webm​ (2.4 MB) - added by patrick.rein 7 years ago. Image-Navigating.webm​ (5.3 MB) - added by patrick.rein 7 years ago. Image-Projects.webm​ (3.7 MB) - added by patrick.rein 7 years ago. Image-RecoverFromCrash.webm​ (7.5 MB) - added by patrick.rein 7 years ago. Monticello-DiffingAndChanges.webm​ (7.6 MB) - added by patrick.rein 7 years ago. Monticello-Introduction.webm​ (3.5 MB) - added by patrick.rein 7 years ago. Monticello-ResolvingConflicts.webm​ (9.6 MB) - added by patrick.rein 7 years ago. Exploring-TranscriptWorkspace-2.png​ (130.9 KB) - added by patrick.rein 7 years ago. Exploring-TranscriptWorkspace-1.2.png​ (47.7 KB) - added by patrick.rein 7 years ago. Image-RecoverFromCrash.m4v​ (7.6 MB) - added by patrick.rein 7 years ago. Image-Updating.webm​ (749.0 KB) - added by eric.seckler 7 years ago. Image-RecoverFromCrash-1.png​ (37.0 KB) - added by patrick.rein 7 years ago. Gemtools.ogg​ (9.1 MB) - added by tim.felgentreff 7 years ago. demo-mode.m4v​ (1.5 MB) - added by willi.mueller 6 years ago. demo-mode.webm​ (538.5 KB) - added by willi.mueller 6 years ago. HowTo-SUnit.st​ (3.0 KB) - added by willi.mueller 6 years ago. SUnit.m4v​ (9.9 MB) - added by willi.mueller 6 years ago. fileout-filein.mp4​ (3.0 MB) - added by willi.mueller 6 years ago. fileout-filein.webm​ (1.1 MB) - added by willi.mueller 6 years ago. fileout-filein.jpg​ (36.7 KB) - added by willi.mueller 6 years ago. SUnit.jpg​ (48.5 KB) - added by willi.mueller 6 years ago. demo-mode.jpg​ (45.5 KB) - added by willi.mueller 6 years ago. test-coverage.webm​ (1.0 MB) - added by willi.mueller 6 years ago. test-coverage.mp4​ (3.2 MB) - added by willi.mueller 6 years ago. test-coverage.jpg​ (53.3 KB) - added by willi.mueller 6 years ago. SwaLint.mp4​ (4.5 MB) - added by willi.mueller 6 years ago. SwaLint.webmhd.webm​ (2.5 MB) - added by willi.mueller 6 years ago. SwaLint.jpg​ (48.8 KB) - added by willi.mueller 6 years ago. image-update.jpg​ (28.0 KB) - added by willi.mueller 6 years ago. Image-Navigating-2.jpg​ (56.9 KB) - added by willi.mueller 6 years ago. Image-Introduction-3.2.png​ (33.7 KB) - added by willi.mueller 6 years ago. Image-Introduction-2.jpg​ (41.6 KB) - added by willi.mueller 6 years ago. image-halos-2.jpg​ (22.1 KB) - added by willi.mueller 6 years ago. image-explorer.jpg​ (26.5 KB) - added by willi.mueller 6 years ago. image.jpg​ (27.6 KB) - added by willi.mueller 6 years ago. Image-Navigating-1.jpg​ (19.6 KB) - added by willi.mueller 6 years ago. Image-RecoverFromCrash-1.jpg​ (19.4 KB) - added by willi.mueller 6 years ago. Image-Halos-1.jpg​ (11.7 KB) - added by willi.mueller 6 years ago. Image-Updating-1.jpg​ (24.6 KB) - added by willi.mueller 6 years ago. 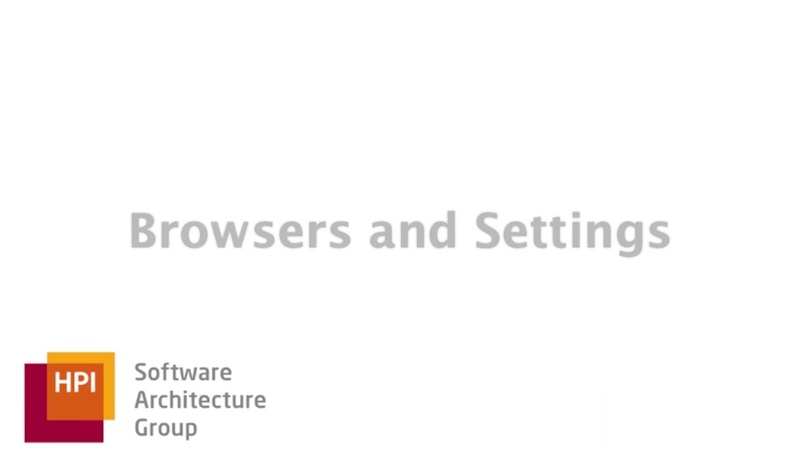 Image-BrowserAndSetting-1.jpg​ (17.3 KB) - added by willi.mueller 6 years ago. Image-BrowserAndSetting-3.jpg​ (24.0 KB) - added by willi.mueller 6 years ago. Image-BrowserAndSetting-2.2.png​ (17.7 KB) - added by willi.mueller 6 years ago. Image-Projects-1.jpg​ (12.7 KB) - added by willi.mueller 6 years ago. Browser-ClassBrowser-1.jpg​ (14.6 KB) - added by willi.mueller 6 years ago. Browser-ClassBrowser-2.jpg​ (61.9 KB) - added by willi.mueller 6 years ago. Image-Projects-2.jpg​ (21.3 KB) - added by willi.mueller 6 years ago. Browser-MethodsInBrowser-1.jpg​ (17.4 KB) - added by willi.mueller 6 years ago. Browser-MethodsInBrowser-2.jpg​ (38.6 KB) - added by willi.mueller 6 years ago. Browser-AdvancedBrowsing-1.jpg​ (89.4 KB) - added by willi.mueller 6 years ago. Browser-AdvancedBrowsing-2.jpg​ (30.8 KB) - added by willi.mueller 6 years ago. Browser-ClassStateSetterGetters-1.jpg​ (24.8 KB) - added by willi.mueller 6 years ago. Browser-ClassStateSetterGetters-2.jpg​ (24.0 KB) - added by willi.mueller 6 years ago. Exploring-TranscriptWorkspace-1.2.jpg​ (25.7 KB) - added by willi.mueller 6 years ago. Exploring-TranscriptWorkspace-2.jpg​ (20.0 KB) - added by willi.mueller 6 years ago. Exploring-ObjectExplorerInspector-1.jpg​ (21.1 KB) - added by willi.mueller 6 years ago. Exploring-ObjectExplorerInspector-2.jpg​ (28.1 KB) - added by willi.mueller 6 years ago. Debug-Debugger-1.jpg​ (14.5 KB) - added by willi.mueller 6 years ago. Debug-Debugger-2.jpg​ (26.9 KB) - added by willi.mueller 6 years ago. Debug-StopProcessing-1.jpg​ (15.4 KB) - added by willi.mueller 6 years ago. Monticello-Introduction-1.jpg​ (27.9 KB) - added by willi.mueller 6 years ago. Monticello-Introduction-2.jpg​ (12.8 KB) - added by willi.mueller 6 years ago. Monticello-Introduction-3.jpg​ (19.0 KB) - added by willi.mueller 6 years ago. Monticello-DiffingAndChanges-1.jpg​ (29.5 KB) - added by willi.mueller 6 years ago. Monticello-DiffingAndChanges-2.jpg​ (19.9 KB) - added by willi.mueller 6 years ago. Monticello-ResolvingConflicts-1.jpg​ (18.8 KB) - added by willi.mueller 6 years ago. Monticello-ResolvingConflicts-2.jpg​ (48.2 KB) - added by willi.mueller 6 years ago. FiletreeGit.mp4​ (24.2 MB) - added by eric.seckler 5 years ago. FiletreeGitMerge.mp4​ (27.6 MB) - added by eric.seckler 5 years ago. FiletreeGitMerge-1.2.jpg​ (63.9 KB) - added by eric.seckler 5 years ago. FiletreeGitMerge-1.jpg​ (63.9 KB) - added by eric.seckler 5 years ago. FiletreeGitMerge-2.jpg​ (93.8 KB) - added by eric.seckler 5 years ago. FiletreeGit-1.jpg​ (63.7 KB) - added by eric.seckler 5 years ago. FiletreeGit-2.jpg​ (79.0 KB) - added by eric.seckler 5 years ago. FiletreeGit.webm​ (29.6 MB) - added by eric.seckler 5 years ago. FiletreeGitMerge.webm​ (52.6 MB) - added by eric.seckler 5 years ago. GitFileTree-MergeDriver.mp4​ (2.9 MB) - added by fabio.niephaus 4 years ago. GitFileTree-MergeDriver.jpg​ (129.2 KB) - added by fabio.niephaus 4 years ago.